Illinois and Colorado are the only two states to make the list all five years it has been in existence. Although Washington, DC is not included on the official list because of its designation as a federal territory, its addition would effectively ruin the competition. DC’s mixture of numerous LEED-certified projects combined with a relatively small population create a per-capita square footage that is nearly 10 times that of any of the states on the list. The mid-Atlantic region is the hottest area for green building. In addition to Washington, DC’s prominence, Maryland and Virginia have been in the top four for the past two years and while North Carolina is not included in the 2015 list, it placed seventh in 2014. 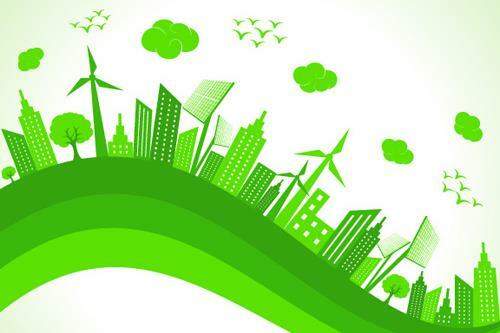 The south and southwest regions of the US are showing serious growth in green building. Both Georgia and Arizona cracked the top 10 for the first time. 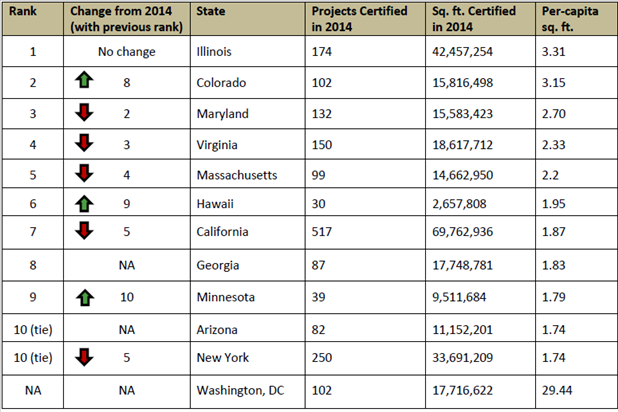 Even though Maryland showed an increase in LEED-certified projects and per-capita square footage, the Free State still lost its number two spot to Colorado, with the Centennial State nearly doubling its per-capita square footage from 1.77 to 3.15. Two LEED rating systems make up 94% of the square footage certified within the top 10 states, with LEED for Building Operations and Maintenance proving the most popular (48%) while LEED for Building Design and Construction was a close second (46%). LEED for Interior Design and Construction was a very distant third, accounting for just 6% of total square footage certified in these states.